Chapter 17-A: What Is It To Be Sanctified? In the seventeenth part of A Plain Account of Christian Perfection, John Wesley discusses the substance of four Annual Conferences. With the exception of the fourth Conference, Wesley lists only the questions and summarized answers. Because I don't believe that this does justice to our understanding of the complexity of some of the questions and answers, I have broken down this Chapter into several parts, the first being 17-A: What Is It To Be Sanctified? In the context of Paul's letter, this Bible verse becomes clearer. The Updated Version of the New American Standard Bible gives Ephesians 4:17-32 the title "The Christian's Walk", which is a way of describing our being sanctified and made perfect. I have chosen the following verses from the NASU, because I believe it is easier to read and understand than the KJV. 19. and they, having become callous, have given themselves over to sensuality for the practice of every kind of impurity with greediness. If Christians are no longer to be like the unbelievers, then how do some churches justify their "health and wealth gospels"? How do some churches justify gambling? How do some churches justify taking pleasure in the suffering and death of an animal, which they do when they hunt, fish, or eat an animal? How do some churches justify arming themselves and taking revenge and fighting a war? How do some churches justify being like the ungodly people of this world? I personally don't believe they can justify any of these things and still believe we are to be sanctified. 24. and put on the new self, which in the likeness of God has been created in righteousness and holiness of the truth. Previously, we discussed the fact that our Christian perfection begins with our spirit being renewed back into the image of God, who is Spirit, so that we would have the mind of Christ (1 Corinthians 2:16). It is this renewed spirit and mind that works to overcome the imperfections and lusts of our fleshly bodies. In other words, if we are truly sanctified, then our lifestyle should reflect this change away from the ways of the ungodly. Paul continues his letter by discussing some of the more common problems encountered in his day and how the renewed Christian is to be different. 25. Therefore, laying aside falsehood, SPEAK TRUTH EACH ONE OF YOU WITH HIS NEIGHBOR, for we are members of one another. We give the devil an opportunity, when we proclaim our "Christianity" before non-believers, and then proceed to do the things that Jesus would not do, or say what He would not say. Then the devil convinces these unbelievers, and also weak believers, that Jesus must be a "lie", because we are living a "lie" in Jesus' name. 28. He who steals must steal no longer; but rather he must labor, performing with his own hands what is good, so that he will have something to share with one who has need. 29. Let no unwholesome word proceed from your mouth, but only such a word as is good for edification according to the need of the moment, so that it will give grace to those who hear. 30. Do not grieve the Holy Spirit of God, by whom you were sealed for the day of redemption. 31. Let all bitterness and wrath and anger and clamor and slander be put away from you, along with all malice. 32. Be kind to one another, tender-hearted, forgiving each other, just as God in Christ also has forgiven you. I don't believe Paul ever envisioned a world like the one we live in today, but even with all our technology, the simple common denominators of Godly living have never changed. "A. The loving God with all our heart, and mind, and soul (Deuteronomy 6:5). Actually, the word "mind" does not appear in Deuteronomy 6:5, but in the expanded definition given by Jesus as in Mark 12:30. The Hebrew understanding of "might" was everything the person "was" and "possessed". Often, who we are is who we perceive ourselves to be, or our mind's thought process, dreams, and desires. The way we love, whether conditionally or unconditionally, is a factor of the way we think, or of our mind. To love God with every part of our spiritual and physical being is to love unconditionally. To unconditionally love God means that we also love the whole of creation, that very good work that God lovingly spoke into existence. If we say we love God, but focus our mind on the ungodly things and ways of this world, and participate in some of them, then our love is not perfected in the way that Jesus explains to us; for we would be living a lie, rather than the truth that is in Christ Jesus our Lord. If we truly love as God loves, then we will focus our mind on the things of God and live as the Lord desires us to live. "A. Undoubtedly; or how can we be said to be 'saved from all our uncleannesses'?" (Ezekiel 36:29). When I first read (internalized) this portion of Ezekiel, I said to myself that this is the Hebrew understanding of being "born again". All too often, Christians think that being born again is a "Christian thing" only, because it is spoken of in a conversation between Jesus and Nicodemus in John 3. In coming to this conclusion, these Christians fail to realize that both Jesus and Nicodemus were Jewish; and that when Jesus questioned Nicodemus, "Are you a teacher of Israel, and do not understand these things? ", He was referring Nicodemus to this very passage in Ezekiel, for the Hebrew Scriptures were the only ones in existence at that time. The New Testament writings didn't begin until many years after Jesus' death. Let's look at Ezekiel 36:22-32. 22. "Therefore, say to the house of Israel, 'Thus says the Lord GOD," It is not for your sake, O house of Israel, that I am about to act, but for My holy name, which you have profaned among the nations where you went. The Israelites, like the Christians of today, were to set themselves apart from the other peoples of the world, as a living example of the presence of God in the world and among His people, that the ungodly would turn to the Lord and be saved. But Israel failed to set this example, as I believe most of Christianity is failing today. Gandhi confirmed this when he said (paraphrased), "If it wasn't for Christians, I might have become one." This is a very sad commentary on the Christians of Gandhi's day, and unfortunately, it still rings true, today. When we act like the ungodly people of the world, we are actually profaning God, for we are saying to others that God approves of what we are doing, for we are His followers. One of my earliest Christian prayers was, "Lord, if I do fall into temptation, let me do so in private, that I don't profane Your Name before others." 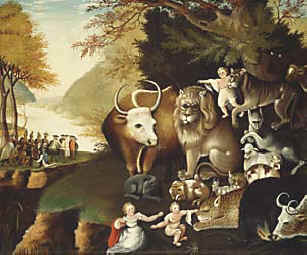 It's because the Israelites were set aside as followers of God, and because the people of the world looked upon them as being so, that God continues to act among them, as He does among Christians, that we would become His true peacemakers and children (Matthew 5:9), that the rest of the world would also return to Him. 23. "And I will vindicate the holiness of My great name which has been profaned among the nations, which you have profaned in their midst. Then the nations will know that I am the LORD," declares the Lord GOD, "when I prove Myself holy among you in their sight. 24. "For I will take you from the nations, gather you from all the lands, and bring you into your own land. 25. "Then I will sprinkle clean water on you, and you will be clean; I will cleanse you from all your filthiness and from all your idols. 26. "Moreover, I will give you a new heart and put a new spirit within you; and I will remove the heart of stone from your flesh and give you a heart of flesh. 27. "And I will put My Spirit within you and cause you to walk in My statutes, and you will be careful to observe My ordinances. This is being born again! Today I hear many Christians speak of being born again and of being filled with the Holy Spirit, yet I see very little evidence in their lives of this being true. 28. "And you will live in the land that I gave to your forefathers; so you will be My people, and I will be your God. 29. "Moreover, I will save you from all your uncleanness; and I will call for the grain and multiply it, and I will not bring a famine on you. 30. "And I will multiply the fruit of the tree and the produce of the field, that you may not receive again the disgrace of famine among the nations. 31. "Then you will remember your evil ways and your deeds that were not good, and you will loathe yourselves in your own sight for your iniquities and your abominations. 32. "I am not doing this for your sake," declares the Lord GOD, "let it be known to you. Be ashamed and confounded for your ways, O house of Israel!" 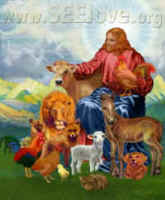 Note carefully that the promise of abundant food given in this blessing contains no animals or animal products; it only contains the plant foods that God gave us in Eden. This is all part of living in the perfection of God. I also personally find this passage very interesting, and spiritually convicting, particularly when we consider the world hunger situation that exists today. In verses 29 and 30, God says that He will multiply the plant foods that there would no longer be any hunger, and for most Christians and Jews this has come true, but we have misused this blessing. If we look at world hunger today and the food requirements that everyone would need to be healthy, we have enough food in the world. The problem is that one fifth of the world is overfed, mostly on animal products, the production of which consumes 50% of the world's grain supply (over 70% in the U. S.). At the same time, one fifth of the world's people are starving. It takes more than ten pounds of grain to produce one pound of animal flesh. This means that we could feed ten hungry people for every human who sustains themselves on a primarily animal food based diet. We are living in gluttony, and not in the blessing. If we were living in the blessing, we would feed the hungry as Jesus tells us in Matthew 35-40. From everything we have learned, animal agriculture is destroying our environment, increasing world hunger, and increasing chronic diseases. Christian perfection calls us to return to a plant based diet. And if we would do this, I believe that God's word is telling us that we would help sanctify the world, along with ourselves.